Based in Cheshire, H2Ecommerce (H2E) undertake pallet storage warehousing along with a range of retail fulfilment and logistics services on behalf of a string of clients spread across industries as diverse as printing and pet supplies. The company operates from a modern 27,0000 sq ft facility in Crewe which comprises 17,000 sq ft of dedicated storage space along with 10,000 sq ft of office accommodation. 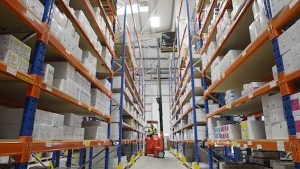 Following a recent review of intralogistics processes, H2E has maximised the utilisation of the store and doubled the pallet capacity at their Crewe site by introducing very narrow aisle racking served by Flexi articulated warehouse truck technology from Narrow Aisle Ltd.
“The decision to reconfigure the layout of the store and adopt very narrow aisle methodology was driven by our need for extra cubic capacity following a period of sustained sales growth,” explains H2E’s E-Fulfilment Manager, Kevin Over. The aisles within H2E’s Crewe store are now just 2.0 metres wide with each pallet rack filled to roof level, which means that the warehouse now has a pallet capacity of 2200 – a 100 per cent increase of 1100 spaces on the previous maximum. The new racking layout has also enabled H2E to maximise the full height of the building for pallet storage, as Kevin Over explains: “Our revised storage system has a top racking beam height of 7.2m which means we are now using all the 9.5m height available within the building. The Flexi AC1000 model articulated truck in operation at the H2E site can lift all H2E customer loads to the top beam within the very narrow aisles at the site and has been supplied with a high definition LCD CCTV system to ensure that H2E’s operators have a clear view of the load and the racking when retrieving and putting away pallets at the highest level. In addition, the truck’s HiVIS lift mast and specially developed integrated tilting and side shifting fork carriage eliminate mast deflection at the highest lift heights – making pallet movement fast and hugely efficient. Like all models in the Flexi range, the AC1000 is able to operate safely both inside and outside the warehouse. This feature eliminates double handling and means that a single Flexi will do the work of two trucks: it unloads or loads vehicles like a counterbalanced truck and operates within the aisleways like a VNA truck. This capability has allowed H2E to reduce the materials handling equipment in operation at the Crewe store from three units to two, as Kevin Over explains: “The Flexi AC1000 has allowed us to replace a reach truck which had limited use as it was unable to work outside or within the new narrow aisle configuration. To further enhance ISO container stuffing and de-stuffing efficiency at H2E, Narrow Aisle supplied 2-metre long fork attachments, which can be easily manually extended when required for offloading palletised products from a shipping container and retracted just as simply when the truck is required within the warehouse. In a typical day some 500 orders are picked, packed and dispatched from H2E’s Crewe facility. Incoming pallets are offloaded from a variety of vehicles by the Flexi truck and products are booked in to H2E’s Storefeeder warehouse manager system using hand-held scanners and allocated a storage location. The Flexi AC1000 then delivers the pallets to the racking system where bulk stock is held at higher locations before being dropped – again using the Flexi – to replenish the pick faces as and when required. On site safety is paramount at H2E and, during the replenishment process, the company employs what it calls a ’two-bay safety rule’ to ensure that order picking staff can carry out their tasks while the Flexi is in operation a safe distance away in the aisle. “The ‘two-bay rule’ simply means that if the Flexi truck and order pickers are working in the same aisle they must always be separated by a minimum of ‘two bays’, or four pallet space, at all times. We therefore ensure correct segregation of pedestrians and materials handling equipment with no loss of productivity,” explains Kevin Over. To further enhance truck operator safety and the wellbeing of other warehouse staff, the Flexi 1000 features both an audible reversing warning and a visual reversing warning that projects a beam of blue light on to the floor 3 metres behind the vehicle to alert staff to the truck’s presence. Kevin Over says: “The Flexi truck has allowed us to double our warehouse capacity by increasing the density of the available storage space. Furthermore, the addition of retractable forks, which we deploy when offloading sea-freight containers, allied to the fact that the Flexi can be used to undertake the jobs carried out by counterbalance and reach trucks, has increased safety and allowed us to significantly improve throughput speeds. John Maguire, commercial director of Narrow Aisle Ltd, commented: “The introduction of Flexi articulated truck technology has allowed H2Ecommerce to maximise the capacity and efficiency of it’s fulfilment centre.